The Reverend Frank D. Tucker was born in Blackstone, Virginia. He attended the Virginia Public Schools and graduated from Foster High School in 1957. He received his BA Degree in Sociology/Philosophy in June 1961 from Howard University. In June 1964, he received his Bachelor of Divinity Degree from Howard University’s School of Religion. Rev. Tucker was College Minister and Assistant Professor of Theology at Florida Memorial College from 1965 to 1966. 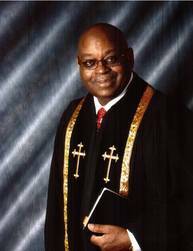 He was then called to Pastor the Jones Memorial Baptist Church in Philadelphia, Pennsylvania from 1966 to 1976. On February 1, 1976, Rev. Tucker became Pastor of the First Baptist Church, located at New Hampshire Avenue and Randolph Street Northwest, Washington, D.C. In 1986, he joined the faculty at the Howard University School of Divinity as adjunct professor. Rev. Tucker is affiliated with many community and religious groups. He is a member of the Baptist Ministers’ Conference of Washington, DC; Executive Committee of the Foreign Mission Board of the National Baptist Convention, USA, Inc.; and is the Facilitator for the Wednesday Clergy Fellowship. He formerly served on the Board of Directors of the Washington Urban League; the Interfaith Conference of Metropolitan and as President of the Baptist Convention of DC & Vicinity; former Chairman of the Board and CEO for the Church Association for Community Services; the Board of Directors of the United Planning Organization, and Former Chairman of the Mayor’s Faith Advisory Council. Rev. Tucker is the recipient of many recognitions and awards, some of which are: The Man of the Year Award for Humanitarian Service (1992); the Martin Luther King, Jr. Humanitarian Service Award (1993); the New England Youth Workshop Century Award (1999); the CACS Faith Award, Tenth Anniversary of CACS (1999); the Judy Halpern Award for making a difference in the World by Religious Coalition for Reproductive Choice (1999); and, the Prophet for a New Millennium Award-Honoring the Integrity and the Power of Prophetic Preaching (1999) presented by the Institute of Great Preaching. Rev. Dr. Frank D. Tucker was inducted in the D.C. Hall of Fame for religion in April 2008. He is married to the former Brenda Barbour and is the father of one daughter, Lisa Elizabeth.